While wall mounted units are fine for a bedroom or study, they may not be so effective for a large open area. Commercial buildings and educational facilities tend to have larger, more open areas that would require a unit that provides more coverage than a wall or floor mounted unit. Wide open recreational areas, like a gym or a game room may need something more effective for covering large distances. Ceiling suspended mini split units are capable of moving conditioned air over greater distances to condition larger spaces with fewer units. 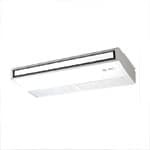 Ceiling suspended mini split units are ideal for moving air over a great distance. For large spaces where a wall mounted unit can't move air across the entire length or width of a room, you can install one of these units instead to reach all areas evenly. These are great for large rooms with floor to ceiling windows, as there would be no wall space for which to install wall mounted or floor mounted units. A ceiling suspended unit can still be installed in this situation, unless your ceiling is also made of glass. A large, open basement may benefit well from this type of mini split unit to condition the entire basement space with one unit, but not if the basement is divided into rooms. In commercial applications, a large showroom, a classroom, a lobby, or a call center are all great applications for a ceiling suspended unit. It's likely that wall mounted units and floor mounted units would be ineffective for a call center, because their air flow would be blocked by cubical walls. A wide open showroom or lobby would also benefit better, because you'd have a more consistent coverage without hot or cool spots. Ceiling suspended units can be secured directly to a ceiling, or they can be suspended from threaded rods below ceiling level. If you have other appliances installed on your ceiling that could block the air flow from your ceiling unit, you may need to suspend the unit with rods, but be sure that it's at least eight feet above floor level. These units should not be installed in the middle of the ceiling. They are designed to be installed against an exterior wall. This is important for a couple of reasons. The air flow can reach across the entire room, from one side to the other. Installing it to move air along the longest stretch of the room is ideal for better coverage, and having it installed on an exterior wall allows you to run the connecting wire, line set, and drain tube directly through from the outside condenser via a 3-inch hole. Avoid installing these units near televisions, projectors, microwaves, or anything else that may give off electromagnetic interference. This will help ensure you have ideal communication between the remote and the unit when adjusting temperature or output. Also avoid installing the unit in a place that gets direct sunlight or anywhere near a heat source. Direct sunlight or a nearby heat source will interfere with the unit's ability to accurately measure indoor temperature, resulting in too much or too little output and an uncomfortable living space. Some of these units offer universal mounting capability, allowing you to suspend it from a ceiling or mount it on the bottom of a wall. However, the universally mountable units are typically not capable of throwing air as far as units strictly designed for ceiling suspension. Many units can be found that are capable of being connected to a fresh air supply via a duct and a fan. Not all units are capable of this, but if you wish to draw fresh air into your space, it's a great way to do so while keeping the indoor air conditioned. To simplify the removal of condensation created during the cooling process, many units include a lift pump. For models that don't include a lift pump, you can find pumps on eComfort (sold separately) from the same manufacturer to incorporate with your unit. Controls vary from manufacturer to manufacturer. 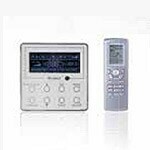 Some include handheld wireless remotes, and others include hard-wired wall mounted controls. This entirely depends upon the manufacturer. Decide what features you want in your ceiling suspended unit, then look for the models and manufacturers that provide those features. Mini Split Suspended Unit Guide - How to Pick the Perfect Mini Split Suspended Indoor Unit. Our heating, ventilation and cooling equipment how-to library can help you pick the perfect comfort solution for your home.